Costas Papachristophorou, General Manager of Kenshō Boutique Hotel & Suites, and WTA President Graham Cooke. Kenshō Boutique Hotel & Suites, located on Mykonos, has been named Greece’s Leading Boutique Hotel 2018, in the 25th World Travel Awards Europe Gala 2018 ceremony, which was recently held at the Zappeion Megaron Hall in Athens. The awards acknowledge, reward and celebrate excellence across all sectors of the tourism industry. “The hotel has been distinguished in yet another global competition, adding one more award to its collection,” Kenshō’s management said in an announcement. Overlooking the blue waters of the Ornos bay, the five-star hotel includes comfortable areas “of high aesthetics, clear style and harmony”. Costas Papachristophorou, General Manager, Kenshō Boutique Hotel & Suites. The rooms, which are decorated based on a special theme, include furniture – works of art by contemporary designers. Combining the spectacular sea view with personalized hospitality, the hotel offers a “holistic product of tangible and intangible pleasures”. 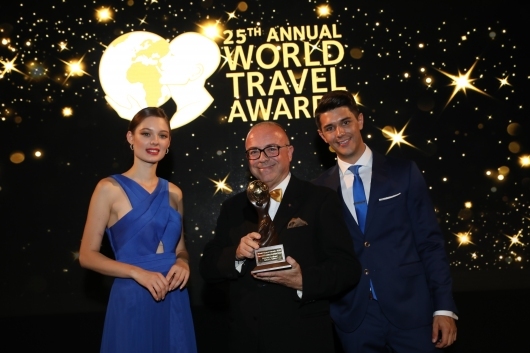 Kenshō’s honor in the 25th WTA Europe Gala follows the accolades it has won at the Greek Hospitality Awards 2018, the World Boutique Hotel Awards 2017 and the World Luxury Hotel Awards 2017.